Invisible braces for teeth offer the ideal solution for anyone looking for a confident smile. There are a huge range of orthodontic options out there, but invisible braces offer the ideal way to change your smile without impacting on your lifestyle. Invisible braces make the decision easy - you can get a great and healthy smile without people even noticing you're going through treatment. Our range of invisible brace solutions include Invisalign and Incognito appliances. Our invisible braces are customised to fit only you and are manufactured through highly specialised laboratories using digital technology so that the appliances are comfortable and effective for you. 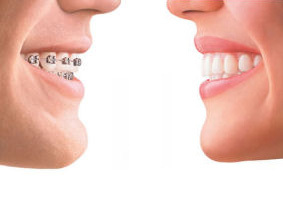 These are discreet, hidden braces that can provide you with the smile that you desire, without having anyone notice that you are wearing any braces at all.